Business owners now know that having an online presence is absolutely essential. This is why we currently see so many companies like Templatic, who help to make the web design process easier and more affordable. Nowadays you can build a great website for around $50, whereas 5 years ago it might have cost you $500+ to hire a professional web developer. 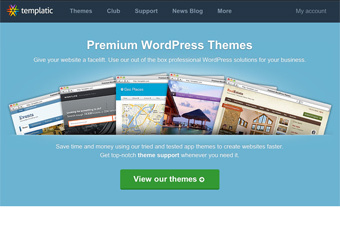 Templatic is a WordPress theme developer that has been in business since 2008. During their time in the industry, they have proven themselves to be consistent and reliable. All of their themes are well designed and highly functional. Templatic has no specific specialty niche, although they do have quite a few restaurant themes for WordPress. Templatic themes have tons of features that will satisfy the needs of just about any business owner. Templatic, unlike some of their competitors, is constantly involved with their themes and their customers. For example, Templatic updates all their themes on a regular basis, in order to keep them compatible with the latest versions of WordPress, as well as several 3rd-party apps and plugins. They also have a great support system, allowing clients to contact them privately through their support desk, or post on their members-only forum for help from other webmasters. Another unique feature that Templatic offers is the ability to test out a theme before you buy it. Most developers offer a demo so that you can see what the theme looks like in action, but Templatic takes it one step forward and allows you to demo the back-end of the theme as well! This allows you to get the feel for the entire theme before spending any money. So whether you’re looking for a restaurant theme for WordPress or a slick theme for your new blog, be sure to check out the selection at Templatic!